Joseph Boussinesq was born in Saint-André de Sangonis which is a small town in the south of France, just over 30 km north east of Beziers and about the same distance west of Montpellier. His father, Jacques Boussinesq, was a farmer who owned a family farm in the district, while his mother, Anne-Marie Cavalier, was the daughter of an industrialist. Both parents wanted to see their son educated, which was certainly not compulsorily at this time, and he attended both primary and secondary education locally. However, much of his education was due to one of his uncles, a highly educated priest. From this uncle he learnt Latin and Greek as well as how to study on his own. After completing his secondary education, Boussinesq wanted to study at Montpellier, the closest town where he could undertake higher education, but he required financial support to enable him to study there. The problem was that Boussinesq's mother died in 1857 and his father made it very clear that his duty was to take over the running of the family farm. His only route was to defy his father's wishes, and to study his favourite subject of mathematics without family support. He managed this by taking employment as a housemaster without teaching duties at the Lycée de Montpellier, while he studied languages and mathematics at the Faculty of Sciences at Montpellier. He was awarded a Bachelor's degree in mathematics in 1861. Having been awarded a degree which qualified him to teach in secondary schools, Boussinesq followed a teaching career being appointed to the Lycée in Agde in 1862, that in Le Vigan in 1865, then in Gap in 1866. These towns are all in the south of France: Agde is, like the town in which Boussinesq was born, in Hérault - in fact it is on the river Hérault, 4 km from the Mediterranean Sea; Le Vigan is 64 km north of Montpellier; but Gap is much further east - it is the capital of the Hautes-Alpes, about 800 metres above sea level on right bank of the Luye River. It was while teaching at the first of these schools in Agde that Boussinesq became drawn towards research in mathematics when he read two texts by Gabriel Lamé, namely Théorie mathématique de l'Elasticité Ⓣ and Leçons sur la théorie analytique de la chaleur Ⓣ. Inspired to undertake research, his first scientific paper on capillarity was presented to the Académie des Sciences by Lamé in 1865. He began working for a doctorate on A mechanical theory of light supervised by Émile Verdet. However, Verdet died in 1866 before Boussinesq's thesis was completed. He was then given another supervisor and, to suit his new supervisor's interests, Boussinesq changed the topic of his thesis and wrote Études sur la propagation de la chaleur dans les milieux homogènes Ⓣ. Lamé had played a major role in advising Boussinesq and the thesis clearly shows his influence in the way Boussinesq approached his subject. Another mathematician who influenced the work was Saint-Venant. The examining committee, however, comprised of Joseph Serret, Joseph Bertrand and Charles Auguste Briot and Boussinesq defended his thesis in Paris before this committee on 13 May 1867. Boussinesq was not a lucid writer and was often too impatient in giving logical explanations so that, on several occasions, Saint-Venant advised him to give clear and detailed arguments in his work. In fact from this time on Saint-Venant was Boussinesq's staunchest supporter and became even more influential in 1868 when he was elected to succeed Poncelet in the mechanics section of the Académie des Sciences. Boussinesq had married Jeanne Giscard de la Roque in 1867 and, but for Saint-Venant's support and advice, might well have settled down to teaching in secondary schools. Saint-Venant understood the system well and was able to advise Boussinesq that to obtain a university position in mechanics would be very difficult unless he had both a mathematics and a physics qualification. He followed this advice and in 1872 was awarded a Bachelor's degree in physics. The Académie des Sciences awarded him their Poncelet Prize in 1872 and he was well set up for a university appointment. Indeed he succeeded in the following year when he was appointed Professor of Differential and Integral Calculus at the Faculty of Science in Lille. ... Boussinesq had been working on open-channel theory for some time. In the steps of his mentor Saint-Venant, he tried to subject every aspect of the motion of water in rivers and canals to mathematical analysis. He was aware of Russell's observations, and also of the more precise measurements of solitary waves performed by the French hydraulician Henry Bazin. He had already written a long memoir on water waves of small height on water of constant depth. In addition to results that could be found in earlier memoirs by Green, Kelland, and Airy (of which he was unaware), he offered a few preliminary considerations on waves of finite height that may have led him to reflect on Russell's wave. In his first derivation of the solitary wave, published in 1871 in the 'Comptes rendus', Boussinesq sought an approximate solution of Euler's equations that propagated at the constant speed c without deformation in a rectangular channel. His success in this difficult task depended on his special flair in estimating the relative importance of the various terms of his developments. His basic strategy was to develop the velocity components in powers of the vertical distance from the bottom of the channel, and to determine the coefficients of this development through the boundary conditions. Lagrange had already tried this route and written the resulting series of differential equations, but had found their integration to exceed the possibilities of contemporary analysis unless nonlinear terms were dropped. A century later Boussinesq managed to include these terms. Boussinesq was no dashing young man when he arrived in Paris at the beginning of 1886. He was a modest looking man. Saint-Venant, his former mentor, was not there to greet him because, by an unlucky stroke of fate, he who supported Boussinesq with so much perseverance from the start of his career in Agde up to the Academy of Sciences, had just died, on 6 January, at the age of 89, twelve days before his pupil's election. Upon arrival among his new colleagues, Boussinesq proceeded to write his former mentor's obituary, in collaboration with Alfred Flamant, Saint-Venant's second favorite disciple. Such events contributed to his further withdrawing into himself; his only distraction was his research and he started working even more relentlessly. 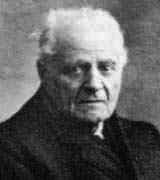 Boussinesq remained Professor of Physical and Experimental Mechanics at the Sorbonne for ten years, until he inherited the more prestigious chair of Mathematical Physics and Theory of Probabilities, a position which he kept until his retirement in 1918 at the age of 76. One still had to observe that in most heat-induced motions of our heavy fluids, the volumes or densities are approximately conserved, although the corresponding variation of the weight of the unit of volume is actually the cause of the phenomena we are studying. One possibility stems from there: neglecting the variations of the density where they are not multiplied by the gravity g, while conserving its product by the gravity in the calculation. He had already published a number of other important texts in such as Application des potentiels à l'étude de l'équilibre et du mouvement des solides élastiques Ⓣ (1885) while still in Lille, and, after moving to Paris: Cours d'analyse infinitésimale en vue de ses applications mécaniques et physiques Ⓣ (2 volumes) (1887 and 1890); Leçons synthétiques de Mécanique générale servant d'introduction au cours de Mécanique physique Ⓣ (1889); and Théorie analytique de la chaleur mise en harmonie avec la thermodynamique et avec la théorie mécanique de la lumière, Tome I : Problèmes généraux Ⓣ (1901). Withdrawn by nature, he became more and more solitary. In his obituary in 1933, his colleague Émile Picard only talked about Boussinesq's last years as an academic. However, even academically, Picard stressed how introverted his colleague had been. ... Picard pointed out, however, that there was no bitterness in Boussinesq's solitude. Although shy and withdrawn, he never judged people severely. Every day, almost until the end, he would come to the library at the Academy and sit at the same table. That was his only link with the outside world. ... particularly on the conciliation of determinism and free will. He humbly admitted "the smallness of the ensemble of our unclouded knowledge is lost in an ocean of darkness." One of his conclusions was that simplicity is indispensable in scientific organisation and that intuition is a valuable guide. Boussinesq loathed the introduction of such monsters as continuous functions without derivatives and of non-Euclidean spaces. Hostile to relativistist innovations, he remained loyal to classical mechanics and the sure reality of the aether. ... By virtue of the spirit of his research he can be considered one of the last figure of classical science in the nineteenth century.